A creepy optical illusion and self-portrait. I’m slowly but surely getting my head back in the game. 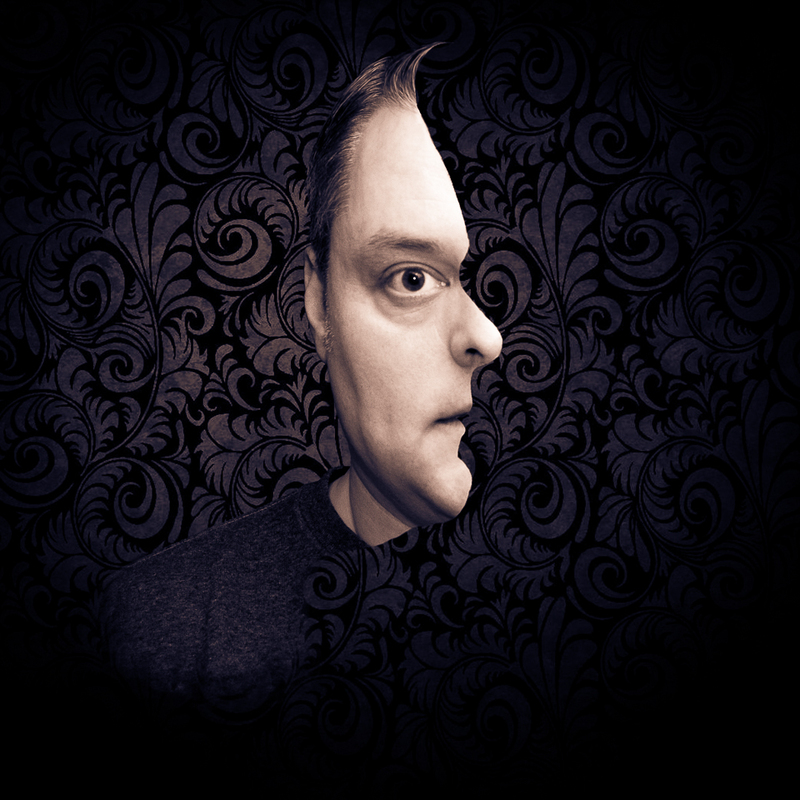 In the meantime, here’s a very creepy and odd looking optical illusion self-portrait I created this morning. It has been a year since I posted on these pages. How time flies now the years seemingly advance ever quicker as I get equally older. 2012 turned out to be a very difficult year on the whole, but had many moments of joy too. I had several family issues and found myself with very little time to continue the stories I would otherwise have thrown myself into completing. My children, as always, took a great deal of my time, (that I will always give gladly) — but, without going into detail, other dearest family members who live on the other side of the planet endured some terrible personal news and events. The long and short of it is that I didn’t write as often as I otherwise would as I was either emotionally too preoccupied or otherwise engaged in offering whatever limited support I could to some of those I love the most. I was able to spend some significant time working on “The Crowd” over the past year despite what I have written above, so this story is almost now at a complete first draft stage. It is currently at around 45,000 words, with several scenes needing to be fleshed out and expanded, so it may well end up being a short novel, despite my original intentions for it to be much shorter. What I’m currently up to. I thought I would spend a moment just to let people know what I’m currently working on. I am taking a short break from the novel I’ve been writing (or rather, not writing as the case has been recently). The reason for this is because I had an idea a couple of months ago that propelled itself into a minor obsession and demanded that I write it first. This story is titled, “The Crowd“, and is a supernatural thriller. Jay Porterfield is recovering from injuries sustained in the car crash that killed his wife. After being discharged from hospital, Jay begins to experience strange occurrences that quickly intensify and send his life spinning out of control. Initially fearing for his sanity; suspecting grief or a brain injury has led to distorted perception, Jay strives to determine the true nature of what is afflicting him. What he discovers is more disturbing than he could ever imagine. My short story “A Selfish Agenda” now available to read online. The November 20 11 issue of Paranormal Underground magazine is now available to read online. Click here to view the magazine or click the cover to the right. This issue contains my short story “A Selfish Agenda” which won first prize in Paranormal Underground’s 4th Annual Short Story Fiction Contest recently. I am very pleased to announce that I have won first prize in Paranormal Underground Magazine’s 4th Annual Short Story Contest. I have been a fan and reader of this magazine for a long time, (and have previously had articles published within its pages.) I was thrilled to receive an email from the magazine’s Editor-In-Chief a few days ago informing me of my success in the contest. As I have not entered any of my writing into any sort of contest before, I feel proud and humbled that people enjoy my stories and style of writing. As much as anything though, this news males me feel validated in my choice to write. My story, “A Selfish Agenda“, is published in the November 2011 issue of Paranormal Underground magazine. This story was written specifically to be my entry into the contest. The magazine can be read online for free on the Paranormal Underground main website. Printed copies and PDF files of the magazine (and all back-issues) can be ordered from the Magcloud website. If you have stumbled across this website already then I apologize. There’s little of interest here… yet. I’ve registered this domain and started to set up these pages in preparation for when I will have something to say. Having written short-stories and articles for some time, I’d increasingly developed the notion and desire to write full length novel. I am currently working on this project and I’m hoping it will be the first story of several containing several of the characters introduced in this first story. I’ve been working on my first novel for several months now as well as other smaller projects, (in the time I am able to — having small children means spare time is a precious commodity!) Over this time I’ve developed a vastly increased appreciation towards any writer who has found the dedication and endured the personal sacrifices required to finish any full-length novel length story. In the meantime, I’ll aim to post other news, links and general bits and bobs here that I feel may be of interest.